While one of the greatest facts on honey storage is that it doesn't spoil even with no preservatives and additives, liquid honey is susceptible to physical and chemical changes over time; it can darken and lose some of its aroma and flavor when there is no proper storage. For commercial reasons, a certain shelf life is often stated on the honey bottles in the shop. 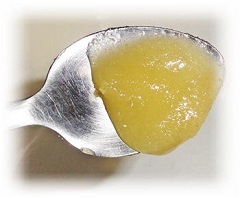 Over time, liquid honey also tends to naturally crystallise - a process where the honey appears to be thickened, become lumpy and grainy (see the image below). The rate of crystallisation varies for the different types of honey. Tupelo honey and Acacia honey, for instance, tend to stay liquid and is able to resist crystallization better than other types of honey, whereas Dandelion, Clover and Lavender honey rush to crystallise. 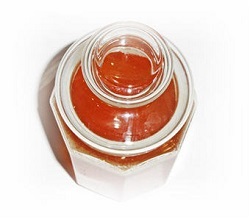 Crystallisation is easily reversible and does not affect the taste and quality of the honey at all, although it adversely changes its appearance. So, please don't throw away sugary-looking honey, it hasn't gone bad! It's easy to restore granulated honey to its natural state, for instance you could put grainy honey on hot toast, the granules will melt as you eat. You can also place a granulated jar over hot water (about 40 degree C), as soon as the granules are dissolved, remove the honey from the heat and let it cool as quickly as possible. Remember, avoid adding boiling hot water to honey! Honey that has been processed and heated will remain liquid for a few months. For this reason, some manufacturers do pasteurization whereby the honey is heated very quickly and then rapidly cooled to slow down the granulation process of the honey (especially for certain floral varietals) so that they will last longer in its liquid state (and look desirable) on the shelves. We often read from honey storage tips that honey can be kept at room temperature and should not be stored in too cold nor too hot place. The problem here is it can be confusing because room temperature varies from country to country! For instance, where I live, room temperature sometimes could be as high as 35 degree C but I usually do not refrigerate my honey as cold temperatures hardens it and makes scooping and mixing it with other foods and beverages difficult, and it also speeds up the process of granulation. Honey should be stored in a cool dry place, making sure that the container cap is on tight since honey tends to absorb moisture from the environment, which can cause fermentation and lower its quality. Always scoop honey from jars using a dry spoon as any introduction of water content into the jars should be avoided. Store honey away from direct heat (eg near stove area, hot kitchen appliances) or sunlight (next to the windows) as excessive heat over time can affect honey properties. And this is the reason why some honey comes in dark containers. However, these dark containers do not allow consumers to judge the color, viscosity, and crystallisation of the honey. While glass packaging is preferred by some people as glass is relatively neutral and doesn't react with food and cause any chemical transfer, storing honey in food grade plastic containers should not pose any safety or health concern as well. For honey which possesses a naturally high moisture content, yeast may reproduce over time without proper storage, causing fermentation. While fermentation does not necessarily pose any health risk (mead by the way is fermented honey), some manufacturers pasteurize their honey to kill any yeast cell. For honey that is very runny and requires long term storage, I would advise leaving it in the fridge to prevent any possible fermentation and change of taste. Should Metal Spoons be Used? One more very frequently asked question - should metal spoons be used for scooping honey? While some people believe metallic composites can affect the taste of foods, I personally love wooden cutlery but don't see why stainless steel spoons should not be allowed and why the brief contact between the spoon and honey can be an issue. I also suppose none of the equipment used by beekeepers in storing and extracting honey from the combs is made of glass or wood. Does honey with longer expiration mean fresher honey? 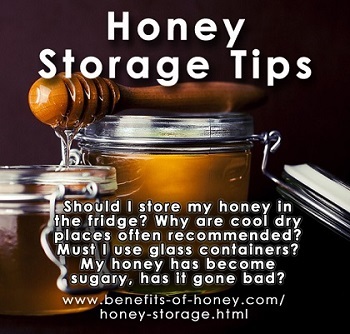 End of 5 Best Honey Storage Tips. Back to Quick Honey Facts.